Alice Loh is a professional makeup artist with special interest in fashion and style. This channel shows beyond the portfolio, sharing photos and personal finds from the different corners around the globe. 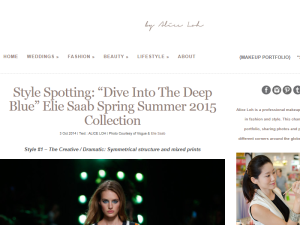 This what your By Alice Loh - Malaysia Fashion & Beauty Blog Blog Ad will look like to visitors! Of course you will want to use keywords and ad targeting to get the most out of your ad campaign! So purchase an ad space today before there all gone! If you are the owner of By Alice Loh - Malaysia Fashion & Beauty Blog, or someone who enjoys this blog why not upgrade it to a Featured Listing or Permanent Listing?